from April 1st - 5th 2019 at the exhibition center HANNOVER MESSE! It is therefore a great pleasure for us to invite you for a visit of our booth „K22“ in hall 6. Again a number of innovative features have been incorporated into the development of our tools this year. Be the first to get a picture of those new features in a personal conservation with us. 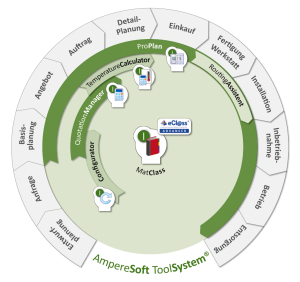 Let us introduce you to the latest developments of our CAE-tool ProPlan. Now we automatically "route" you to the future. Take a closer look at our fluid and R&I flowchart and the updated symbol tablets. Interested? We can provide further information to you about the fully automatic wiring routing, cross-cabinet and taking into account doors and other depth dimensions by determining the 3D coordinates. We will show you how AmpereSoft MatClass supports you in the maintenance of your products with eCl@ss ADVANCED and greatly simplifies the distribution of your product data to business partners. You will receive an exciting preview of the advanced development of how data can be used in and out of the cloud and the benefits resulting from it for you. Experience how tasks in the engineering process can be done software-supported and automated simply by using eCl@ss ADVANCED Data. We are a new member of AutomationML e.V. now and we are looking forward to discussing with you at our booth, how and why together with strong partners we can intensively promote the standardized exchange of engineering projects - not only for Industry 4.0 and BIM. We would like to share information about the ServiceFlow project and show you how to create a lifecycle planning and installation process for building automation systems and which innovations are incorporated. The goal of the cooperation between the "ServiceFlow" research group of the Dresden University of Technology and us is an open service platform along the entire value added chain of smart buildings. Then register right now for your personal e-ticket and visit us at our booth. After registration you will receive the e-ticket by e-mail, please print (DIN A4, the German standard paper size) and show it at the entrance then. The personalized trade visitor e-ticket is a permanent ticket vaild for all exhibition days. Note that the trade visitor e-tickets do not include a ticket for the public transport. You might have to purchase tickets for the public transport of Greater Hannover (GVH Großraum-Verkehr-Hannover) separately to get to the exhibition grounds. We wish you a successful trade fair visit and we are looking forward to welcome you at our booth! We are on show again for You - at the SPS IPC Drives 2018! booth no. 6-116 in Hall 6. Join us for a surprise AmpereSoft - Drink and join us in celebrating our company anniversary. Again a number of new features have been incorporated into the development of our tools this year. Get a picture of the new features in a personal conservation with us. Learn more about the latest developments of our CAE-tool ProPlan. Now we automatically "route" you to the future. Let us show you how AmpereSoft MatClass can support you in the maintenance of your products with eCl@ss ADVANCED and how easy the distribution of your product data to business partners actually can be. Save time by maintaining your products using the eCl@ss ADVANCED classification. We are a new member of AutomationML e.V. and we are looking forward to discussing with you at our booth, how and why together with strong partners we intensively promote the standardized exchange of engineering projects - not only for Industry 4.0 and BIM. At our booth, we will show you how to configure a switch cabinet in just a few minutes - reliably receiving all required documents and parts lists. Then download this free entry voucher. Please follow the instruction on the entry voucher for the online-redemption! After the online-redemption of the voucher, your exhibition ticket will be sent to you by email. from 23rd until 27th April at the exhibition center HANNOVER MESSE! So it is a great pleasure for us to invite you to visit us at our booth „J09“ in hall 6 (on the topic "Industry 4.0 meets the Industrial Internet"). Again a large number of innovations has been integrated into the development of our tools. Get a cup of coffee and let us show you personally all the new features. Learn more about the latest developments in the CAE tool ProPlan. We automatically "route" you into the future. Take a look at our fluid and P&ID diagrams and the updated symbol trays. We would like to provide information to you about the fully automatic wiring routing, cross-cabinet and taking into account doors and other depth dimensions by determining the 3D coordinates. You will receive an exciting preview of the further development of how data can be used in and out of the cloud and the benefits resulting from it for you. Experience how tasks in the engineering process can be carried out software-supported and automated by using eCl@ss ADVANCED data. We would like to inform you about the ServiceFlow project and show you how to create a lifecycle planning and installation process for building automation systems and which innovations are included. The goal of the cooperation between the "ServiceFlow" research group of the Dresden University of Technology and us is an open service platform along the entire value added chain of smart buildings. With the CAE- and manufacturer-independent AmpereSoft TemperatureCalculator, you can provide standards-compliant proof of heating in the switchgear according to DIN EN 61439-1. A high proportion of the heating in the control cabinet is caused by the wiring. This information is also included in the calculation. 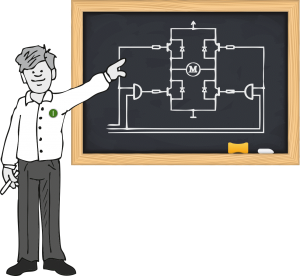 Only through a resource-based and load-dependent calculation with verifiable data (source), a perfect proof of the heating in the switchgear combination can be provided. Create efficient and flexible extensive offers - get to know our QuotationAssistant at the fair. After registration, the e-ticket will be sent to you by e-mail for printing in A4 (German standard paper size) and showing at the entrance. The personalized trade visitor ticket is considered a permanent ticket for all exhibition days. The trade visitor tickets do not include the ticket to the exhibition grounds. For the use of public transport of Greater Hannover (GVH Großraum-Verkehr-Hannover) separate tickets are required. We wish you a successful trade fair visit and we are looking forward to seeing you at our booth! We are pleased to deliver today the update 2016.2 of your Engineering Tools from AmpereSoft. The ToolSystem 2016.2 contains new functions and improvements of our Engineering Tools ProPlan and MatClass and our latest development: the AmpereSoft QuotationAssistant! The ToolSystem 2016.2 will be installed separately from your current ToolSystem version. The ToolSystem setup contains all software tools from AmpereSoft. As usual you find detailed information about the new enhancements in the menu of the ToolSystem start dialog by the well-known icon. - By using hot-key Shift+F3, you now get to the foreign language database from every part of the application. Version 2016.2 is activated with the license keys of version 2016.1. Just for the QuoationAssistant a new license request is necessary. QuotationManager licenses with an active Service Agreement are upgraded to the QuotationAssistant license at no charge. Just send us your license request to apply for this upgrade. With the QuotationAssistant you prepare quotations and tenders - adjusted to the requirements of the electrical industry. With pleasure we present to you the AmpereSoft QuotationAssistant in a web meeting or on-site at your company. For the optimal start with the QuotationAssistant we offer a Basic Training. In the 1-day Basic Training, you learn all basic knowledge for the preparation of a quotation with the AmpereSoft QuotationAssistant. Do you wish sound knowledge about the creation of company wide forms and the management of standard master data like wage costs, discount groups and commodity prices in the QuotationAssistant? Then, use our offer for the 1-day Expert Training. You have questions for the installation or licensing of the new program versions? Then our Support is available for you under the phone number +49 228-608847-47 or by e-mail support@amperesoft.net with pleasure. The download and use of data is at your own risk. There is no liability for damage or impairments. Any claims for damages or compensation is excluded.